For too long, Albania has been ignored as a tourist destination. I get it. The country has had to bounce back from a lot. For years, Albania was under one of the most repressive communist totalitarian regimes in history – even North Korea has more trade partners and diplomacy than Albania did thirty years ago. It emerged from the shackles of totalitarianism in 1991 with basically no GDP and virtually no economy. A countrywide pyramid scheme in which Albanians lost a total of 1.2 billion dollars (a fortune, considering how Albanians had only had six years of free market in order to actuablly obtain money to invest) in 1997 sent the country into chaos. But things are way, way different now, and while the country still has far to come to catch up with its neighbors in Europe, it’s making great strides towards lasting progress. 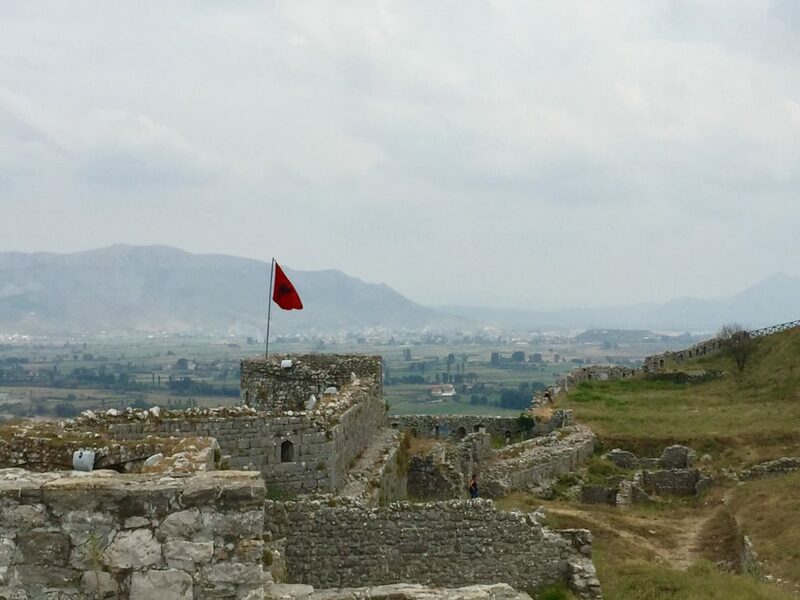 Albania is a country with an unfathomably long history, almost 5,000 years, with influence from Greeks, Illyrians, Romans, Venetians, Byzantines, and Ottomans. To sum up Albania as just what’s happened in the last century is myopic. Yes, Albania has suffered, but it’s bouncing back with incredible fortitude and rightfully emerging as a tourist destination. Seeing as I’ve unofficially become an ambassador for this country, telling everyone who’ll listen about this beautiful place, I figured I’d put it in writing and save myself the trouble. 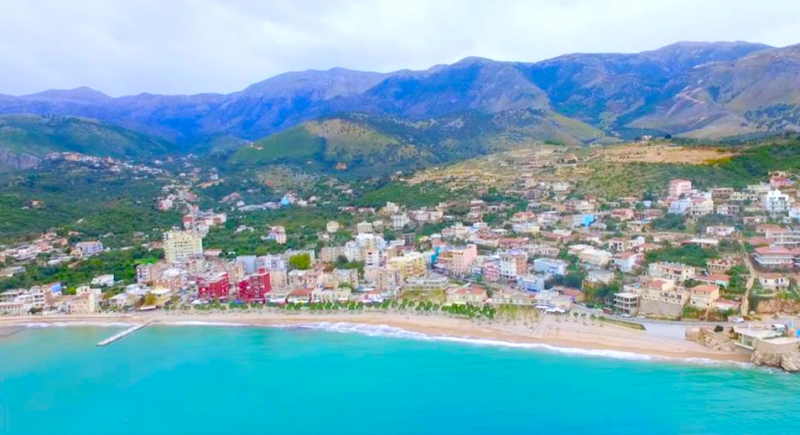 Without further ado, here are 75 reasons why you should book a trip to Albania as soon as possible! It’s off the beaten path. Can you imagine going to 2,000 year old Roman ruins and not having to wait for people to get out of your shot constantly? Well, in Albania, it’s not only possible – it’ll happen all the time. 2. It’s not just affordable – it’s cheap. Traveling anywhere in Balkans, with the exception of Croatia, is inexpensive compared to Western Europe. But Albania is leaps and bounds cheaper than its neighbors, especially when it comes to transit and food costs. A six hour bus ride will set you back only $7 USD; a gyro, $1 USD; a 3-course meal with an espresso, $8 USD. 3. The beaches are the best in Europe. Sorry, Croatia, Italy, Greece, and Montenegro, I know you’ll disagree, but Albania has got the best beaches in all of Europe. The stony beaches make the water a gorgeous, crystal-clear turquoise that feels like your real life has been Photoshopped. 4. … And they’re not crowded. 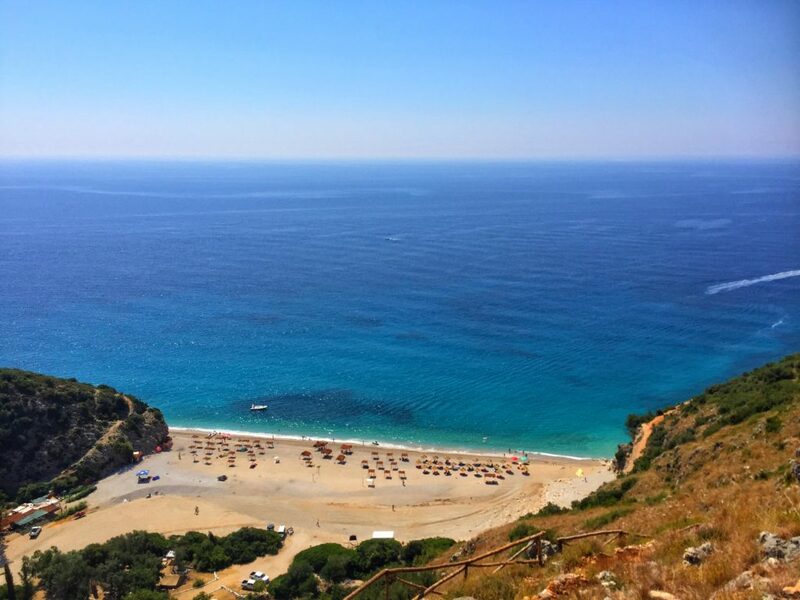 Unlike their more famous Northern and Southern neighbors, you’ll have plenty of space to yourself when you go to the beach in Albania. There are also tons of hidden beaches that you can have basically to yourself with a little creativity (or a little guts!). 5. Albanian people are insanely generous. I’ve never been offered more things in my life – whether it was cake on the side of a road from someone I asked directions, half of someone’s lunch who we hitchhiked with, an espresso at a cafe, or rakia (so much rakia). 6. 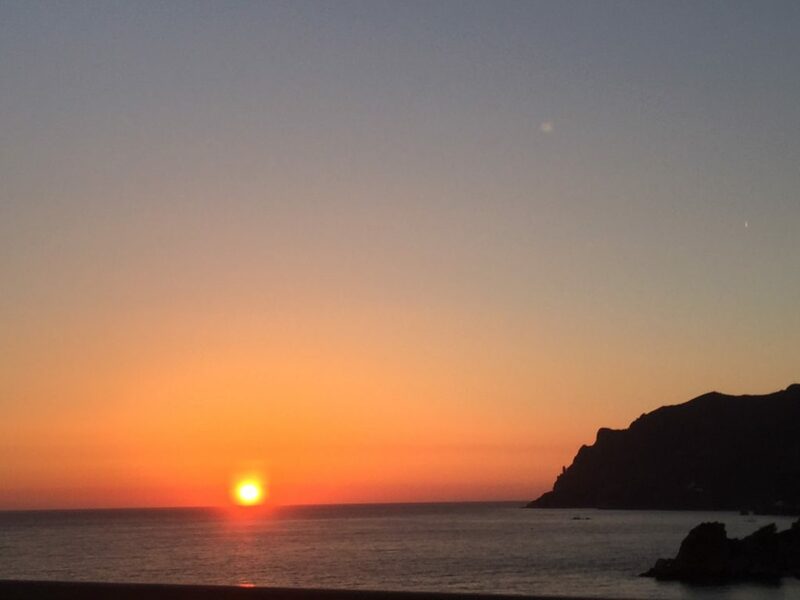 The sunsets along the coast are incredible.From many spots along the Riviera, you’ll be treated to breathtaking sunsets, just as beautiful as Greece’s or Croatia’s — at a fraction of the price. 7. You need to learn the love-hate relationship with rakia. Rakia is basically moonshine, distilled typically from grapes or plums, popular all throughout the Balkans, but especially loved in Albania. The best nights (and the worst mornings) usually are courtesy of rakia. 8. Besa, which is loosely translated as “faith” or “trust”, is extremely important to Albanians. For centuries, Albanians have abided by the code of “besa” which basically means it’s their duty to look after people who need it. That means that even if you’re traveling solo through Albania, you’ll never really be alone. Besa means that my friend’s cousin – who I had never met before – took two days to show me around her hometown, beautiful Korca. 10. Albanians are honest. I’m always on my guard for scams, having been ripped off and nearly pickpocketed within 12 hours in Hanoi. It turns out I didn’t have to worry at all. Meanwhile, in Albania, a man who changed money for a friend ran down the street to the bus station to find us, panicked that he hadn’t given us the right change (but he had). 11. The country is safe. Albania is just as safe as pretty much anywhere else in Europe. You’re less at risk for petty crime in Albania than you are in, say, Madrid, Barcelona, Rome, or Paris, and violent crime is extremely rare. Ok, this photo is of Albanians in Kosovo, but you get the idea. So threatening with their rainbow umbrella and bear phone. Definitely shouldn’t travel here. 12. Street harassment is extremely uncommon.As a women who travels alone, I’m often subjected to street harassment, which makes me feel uncomfortable, unsafe, and irritated. In my entire time in Albania, not one man bothered me on the streets, even when I walked home alone late at night in Tirana. It was such a breath of fresh air to be around such polite, respectful men. 13. Albanians give the best directions. Which is to say they’re either extremely detailed if they speak English, or oftentimes they’ll just walk with you to your destination because they’re afraid of you getting lost. After a flurry of hand gestures did nothing, I once had an old lady in a robe and house shoes pull me by the sweater tied around my waist, leading me up on a ledge, in order to show me how to get to the Berat Castle via the back way. You can’t say these people don’t try. 14.There are countless fortresses and castles that you can explore. Most are have little infrastructure such as informational plaques or warning signs, so you get to feel a bit like Indiana Jones as you explore castles totally on your own. 15. Albanians love Americans. Okay, so this is maybe only exciting for me and my fellow countrymen, but we’re a bit of an unpopular lot in some parts of Europe. And I get it, I really do – I definitely cringe whenever I see the telltale shorts-and-fanny-pack of a clueless American tourist speaking loudly and slowly at someone who speaks perfect English like they’re an idiot. But in Albania, Americans are well-liked – so much so that they’ve even named a street after George W. Bush in Tirana (cool your jets, guys, even we don’t like him!). The town of Fushe Kruje which he visited even has a statue of him! You’ll also find a Hillary Clinton statue in Saranda, Albania. Fingers crossed we never need to find out if they’d erect a Trump statue. 16. But really, Albanians just love all foreigners.You’ll never feel more special as a tourist than when you visit Albania. I was traveling around with a lot of Australians and you should have seen the look on locals’ faces when they found out people from Australia were visiting their country. It was the most delightful mix of confusion, excitement, and pride. 17. 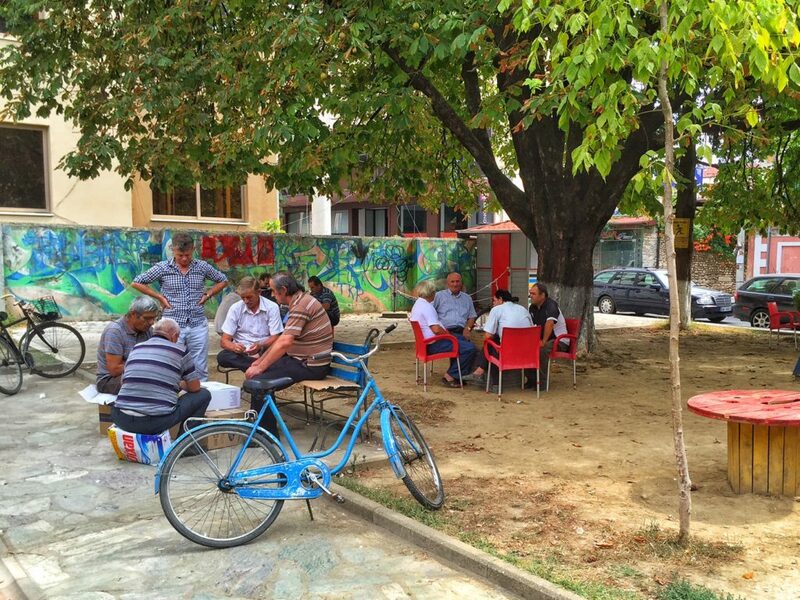 Forget buses and planes – Albania is all about the furgon. Furgons are minibuses, which are often Mercedes vans converted to fit the most human life possible inside them. They’re democratic institutions – first come, first served, they’ll pick you up and drop you off anywhere along the route, and they’ll charge you based on the distance you travel. Sure, some of the seats aren’t that comfortable, especially the ones above the wheels, but I actually quite love the humble furgon. 18. Honestly, the public transit is actually quite reliable – it’s just different. Furgons will get you basically everywhere you need to go, although you do sometimes have to make a transfer rather than going direct. Occasionally, on less popular routes, a minibus won’t run every day, and as the season winds down, minibuses are less frequent. Still, I visited in mid-October as the summer season was done and gone, and even some less popular routes were still roaring. I traveled from Korca to Berat and Berat to Vlora no problems, perfectly on time – in fact, even early in some cases! 19. Infrastructure is improving. I had heard that the roads in Albania were awful – I was happy to find that it really wasn’t the case. Of all the routes I took, I only really encountered one road that was pretty rough and tumble, and it was only because they were working on the main road and re-routed us another way. If you travel very rural in Albania, you’ll encounter some rough roads I’m sure, but the main roads connecting the coastal cities, Tirana, Shkodra, and some of the southern cities like Berat, Gjirokastra, and Korca were all fine. That said, there are still some major flaws. There is no national recycling program and litter continues to be a major issue. Tirana and other cities in Albania have an admirable program to neuter and vaccinate the stray dogs in the cities, but it’s a slow process. Still, considering the country’s economy started from basically nothing in 1991, I think they’ve made tremendous strides. 20. You can even drink the tap water now in many parts of the country. I had heard that Albania’s tap water was totally undrinkable. This was far from true! I drank the tap water without incident in Saranda, Tirana, Shkodra, Berat, and Korca – always after asking a local first just to double check. Since the country is without a recycling program (my inner Californian cringes at this, but progress is slow in the Balkans), try to aim your plastic consumption as much as possible if you go. 21. They make excellent Italian food. Albania is so close to Italy, and they’ve absorbed a lot of their culture. Pizza in Albania is top-notch, probably the next best thing to Italian pizza itself. 22. The coast has amazing seafood. 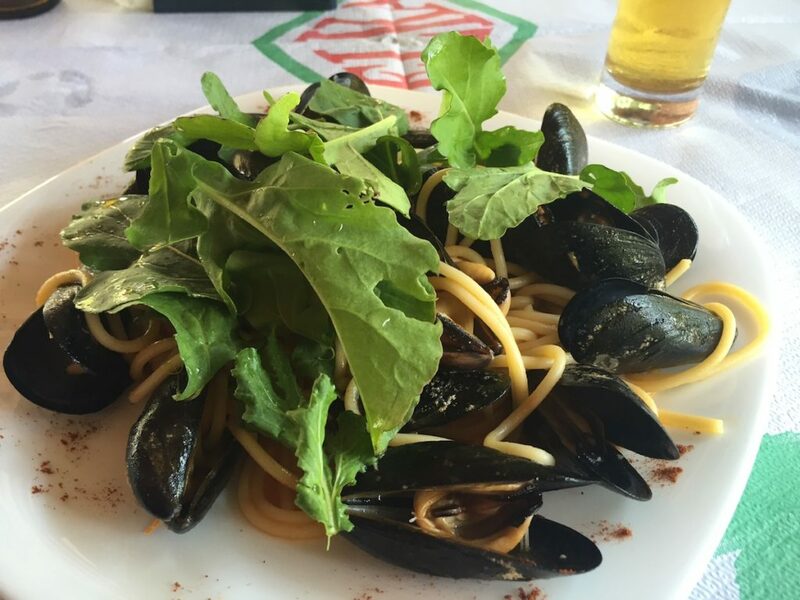 You can eat delicious fresh prawns, mussels, fish, calamari… all for bargain prices and fresh as can be. 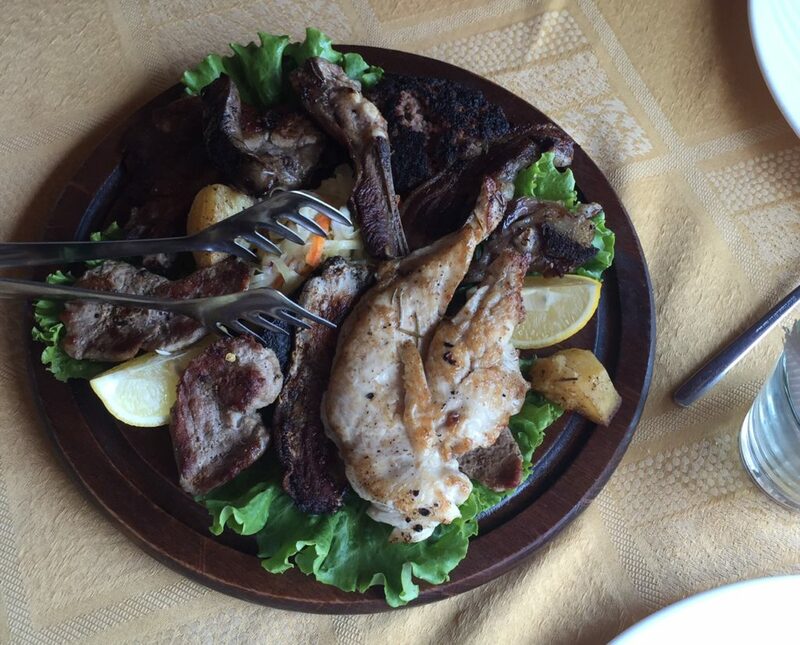 Up north near Lake Shkodra, the lake trout is also incredibly delicious – so make sure you try that if you’re visiting Shkodra or other cities up north. 23. Local dishes are delightful. 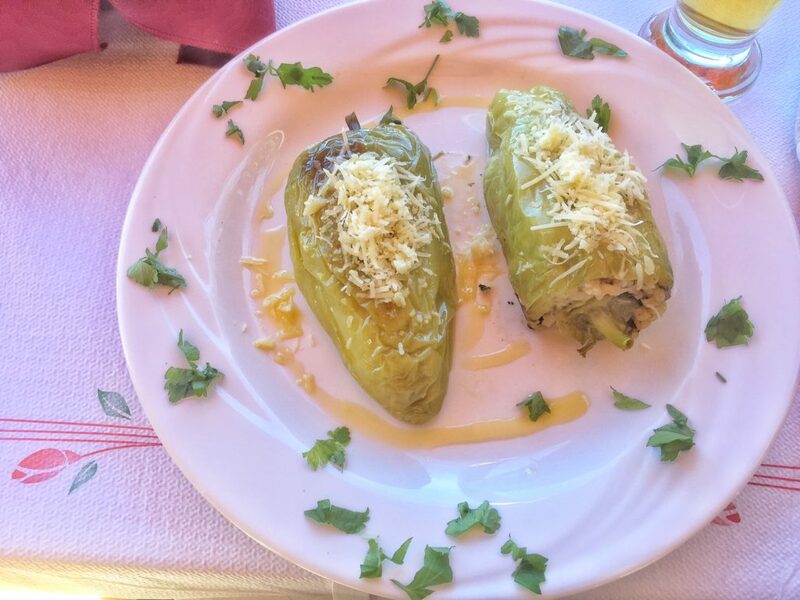 Traditional Albanian specialties like tavë kosi (baked lamb with yogurt) and patëllxhanët mbushur (stuffed eggplant) are unique and delicious, always cooked with local ingredients and fresh produce. 24. A lot of the cuisine is vegetarian. 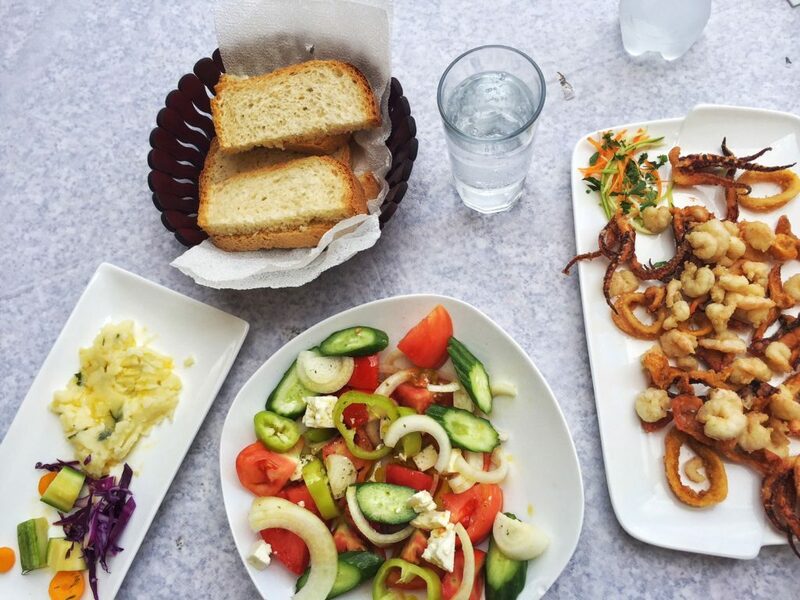 Many of their dishes incorporate veggies in a way that other countries in the Balkans don’t. Their stuffed peppers and grape leaves are almost always vegetarian and filling, they offer a wide variety of salads, and grilled vegetables are available everywhere. 25. But they also make a mean grilled meatplate. Ahh, a well-balanced meal… look, there’s even lettuce! 26. They make excellent coffee. Albanians love their coffee, especially espresso, and you can get an espresso for as little as 50 lek – about 40 euro cents. I will say that sometimes their definition of a cappuccino would make Italians shudder, as they sometimes come topped with whipped cream, but there are worse things than free whipped cream, right? 29. The mountains are absolutely beautiful. My biggest regret about Albania is that I didn’t get to do the hike from Valbona to Thethi that I had planned on. Crazy storms were raging when I was in Shkodra, making the hike I was planning to do the next day impossible, so I rerouted to Kosovo and traveled through the rest of the Balkans. By the time I returned to Albania, it was mid-October and reaching below freezing at night, so a hike didn’t feel like the best idea. But seeing the same mountain range in Montenegro and Kosovo, I can only imagine how beautiful it is in that part of Albania. But you don’t need to travel to Valbona to see mountains – they’re everywhere, even leading right down to the beaches in some cases. 31. That being said, locals will love you if you try to speak Albanian. Albanians know how difficult their language is, and they really appreciate it when you take the time to learn a few words of Albanian. Mirëdita (meer-deeta) – good day, faleminderit (fah-le-min-DER-it) – thank you, diten e mirë (deet-en ay meer) – Have a good day, and of course, gëzuar (guh-zoo-ar) – cheers: master these four and people will be delighted. 32. The rural parts of the country are stunning. 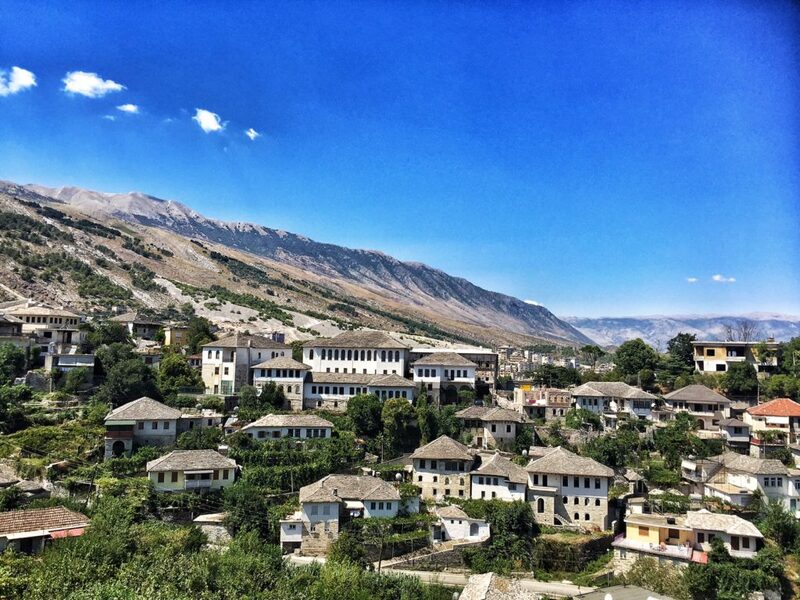 I haven’t seen many Albanian villages or rural life, which I’ve been told is where the real heart of the country is. But my method is to always leave a stone unturned, so I know I’ll come back. What I’ve seen of rural Albania from the furgons is incredible, and I’d love to discover it more deeply. 33. The Albanian flag is so dope. A double-headed eagle… god, could a flag get any cooler? Albanians are obsessed with their flag, and honestly, so am I. So epic. 34. On a similar note, Albanians are really patriotic. While sometimes this patriotism can border on nationalism (which is not unique to Albanians, of course), what this means in practical terms for the traveler is that Albanians will do anything to make sure you love their country just as much as they do. If you tell them you love their country, most will beam with pride. 35. Hitchhiking is incredibly easy and safe throughout Albania. The combination of a lack of a centralized public transit system, the Albanian hospitality and belief in besa, and an outsized love for their cars all merge to make it probably one of the easiest places to hitchhike in the world and definitely in Europe. It’s also quite safe, which you wouldn’t expect if you take your travel advice from Liam Neeson, but it’s true! 36. In fact, hitchhiking is an amazing experience there and I recommend it to all travelers. During my hitching experience, I was picked up by a trucker who didn’t speak a word of English but was all smiles, two young college students who brought us all the way to Kosovo even though they weren’t planning on crossing the border, and more than a couple Mercedes Benzes. 37. Mercedes Benzes are the national car. OK, not really, but it’s kind of ironic that one of Europe’s poorest countries has more Mercedes Benzes than anywhere else I’ve been – including NYC and California. 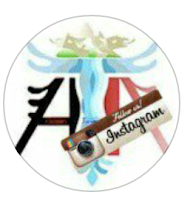 For a more detailed explanation, read on here. 38. It’s easy to travel to and from other countries in the region. 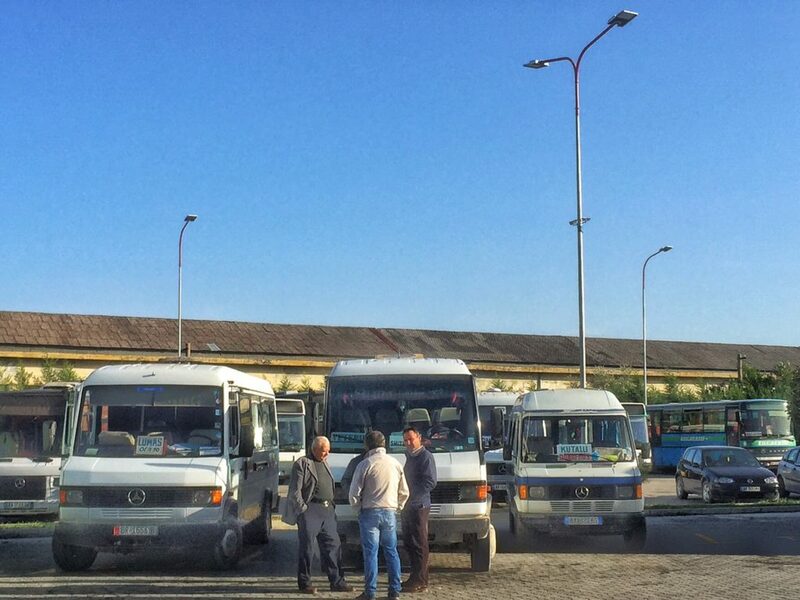 There are frequent public buses from Montenegro via Ulcinj and Shkodra as well as direct buses run by hostel companies from hotspots like Kotor to Tirana. 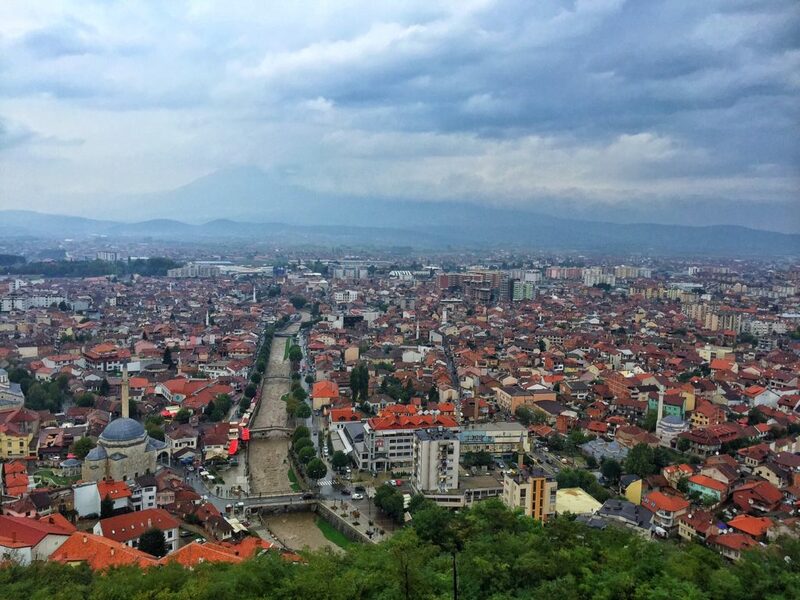 Going from Tirana to Prizren or Prishtina in Kosovo is also quite easy. If you’re thinking of going onto Macedonia, there are Tirana to Skopje buses and in peak season direct buses between Ohrid as well, which can also be accessed via Berat, Elbasan, or Korca. Greece is close to Saranda and Korca, and you can take a ferry to Corfu in about thirty minutes. 39. Oh, and Italy is only a short boat ride away, too! If you’re in Italy and want to make your way over to Albania, it’s actually really quick and affordable to catch a ferry to Albania. A bonus? The views are beautiful. 40. Tirana is unlike any other capital city I’ve seen. It’s chaotic and exhilarating, unique and intriguing, improvised and improving. There’s a sense that it’s stuck in the past at the same time that it’s accelerating towards the future, and it’s fascinating to be right there with it. 41. Tirana was more influenced by communism than other cities in Albania, making it ideal for history and communist architecture geeks. 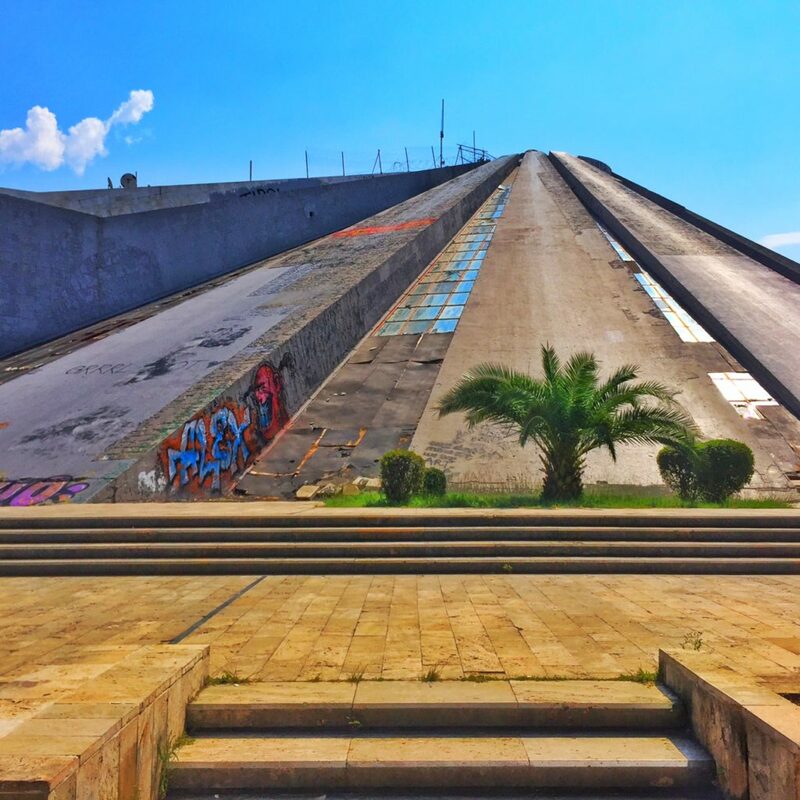 There are some absolutely strange pieces of architecture in Tirana, in particular, Piramida, the abandoned memorial to deceased dictator Enver Hoxha that is now a TV station/slide/tourist oddity. 42. The nightlife in Tirana is really fun. I loved going out in the Blloku neighborhood, the old heart of the communist party loyalists. This has turned into a hipster/upscale neighborhood of sorts, where a draft beer goes for (*gasp*) 2 euros. 43. The bunkers offer a fascinating, if unsightly, look into the past. 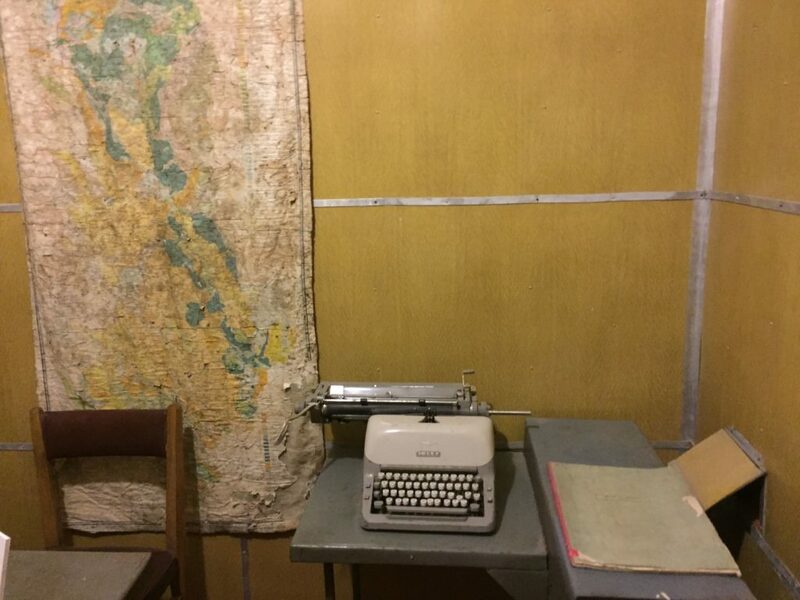 I enjoyed visiting Bunkart in Tirana, which used to be the former dictator Enver Hoxha’s bunker in case of attack. It’s a fascinating insight into the psyche of a sick, paranoid man. An estimated 700,000 smaller bunkers dot the countryside, in places you’d never think would be at risk of attack. 44. In fact, there’s no country quite comparable to 20th century Albania. Under Enver Hoxha, even Tito’s Yugoslavia, Mao’s China, and Khruschev’s USSR were all just too liberal and not purely communist enough. As a result, Albania had no external ties with other countries from 1978 until 1991. When the dictatorship finally fell, things like bananas and blue jeans were totally brand-new phenomena. Even today’s North Korea has a more open economy than pre-1990s Albania. 45. But there’s so much more than just the Communist past. I understand (and share!) the fascination with Albania’s insane communist past. But before that, Albania has almost 5,000 years of history, with influence from Greeks, Illyrians, Romans, Venetians, Byzantines, and Ottomans. That all has shaped the country so much more than its Communist era, even though those have the most obvious visual influence. 46. The 400-year occupation of the Ottoman empire forever changed Albania in unique ways. 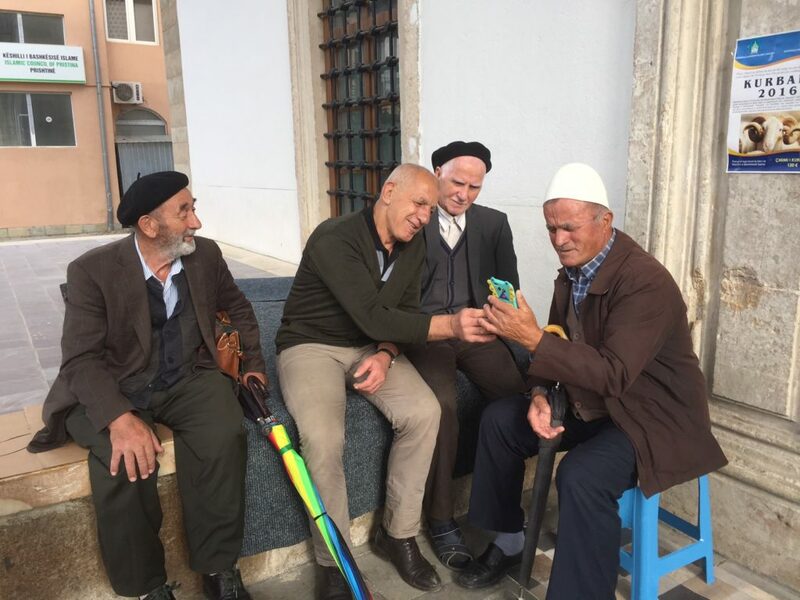 As a result of the occupation, Albania became a majority Muslim country — approximately 60% — although most Albanians follow a very loose interpretation of Islam – if they follow anything at all. Most Albanians, even if they’re of Muslim origin, eat pork and drink alcohol (in fact, I think your Albanian citizenship is revoked if you don’t drink rakia. I kid, I kid), and very few women wear headscarves, regardless of origin (although those who do don’t get any odd looks). 47. Yet for years, Albania was the only country in the world to have an outright ban on religion.That’s right. In 1967, the practice of religion was completely banned within the country of Albania. As a result, unfortunately many churches and mosques throughout the country were destroyed. Albanians have been working hard to rebuild these places of worship throughout the country. 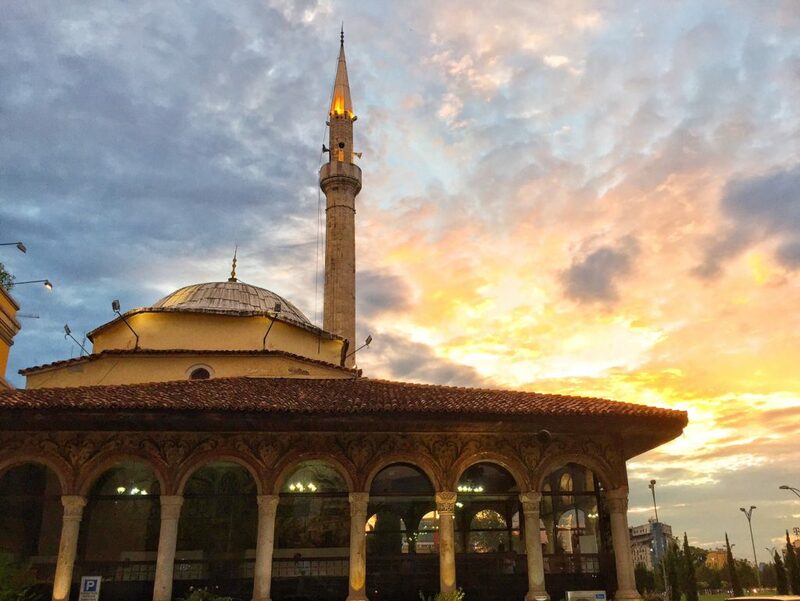 Precious few remain of the pre-Communist era – only those that party leaders deemed worthy of cultural preservation, such Et’hem Bey mosque in Tirana, pictured above. 48. 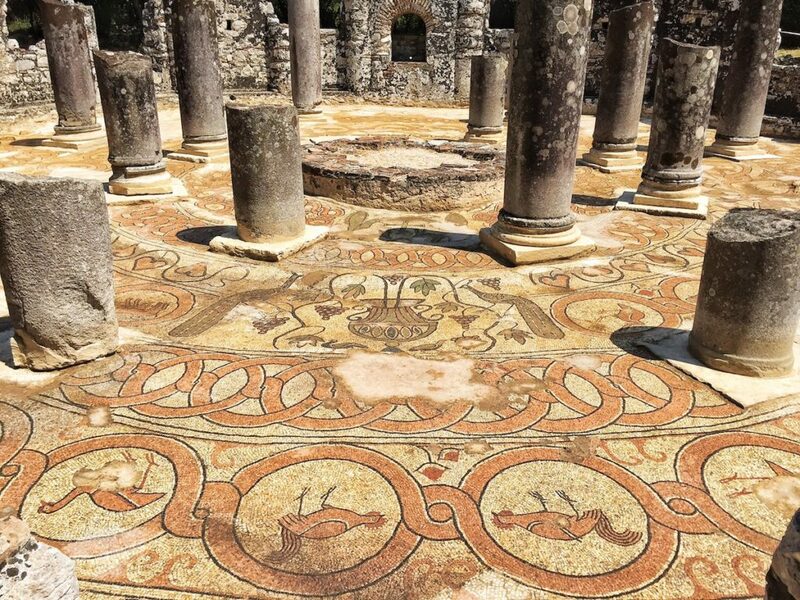 Albania is a true cultural mixing pot.Throughout time, Albania has had the influence of Greeks and Romans, Slavs and Italians, Muslims and Christians. These divisions don’t really seem to faze Albanians, and the unifying fact of language, tradition, and patriotism seem to be more important than ethnicity or religion. 49. Despite all this, Albanians are incredibly tolerant of other religions. Interfaith marriages are quite common in Albania, and friend groups are typically well-integrated and have little to do with religion. Religion appears to be more of a cultural signifier than any deeply held convictions. Unlike countries like Bosnia and Herzegovina, where ethnic strife was in large part exacerbated by religious differences, Albanians really don’t seem to care that much about religion. 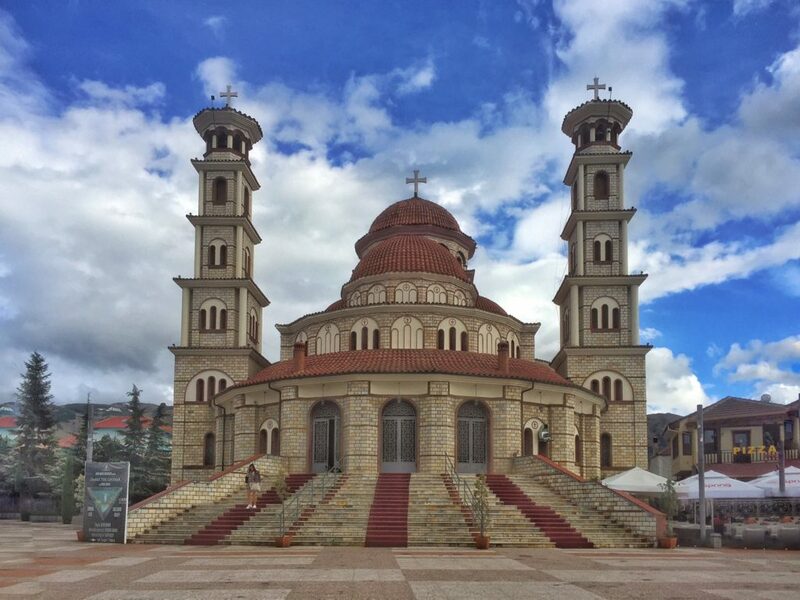 The Orthodox cathedral in Korca was only built in 1992, replacing the church that communists had destroyed in the late 1960s. 50. In fact, for many, “the only religion of Albania is Albanianism.” This quote was co-opted by Enver Hoxha to justify his religious ban; however, it originally appeared in Shkodra-based poet Pashko Vasa’s nationalist poem “O moj Shqiperi”. Basically, that is to say, Albanians are much more concerned with sharing an ethnic and cultural legacy based on the concept of being Albanian, rather than being concerned with any religious ties. 51. Albania is a UNESCO darling, with three major sites having UNESCO Status. 52. 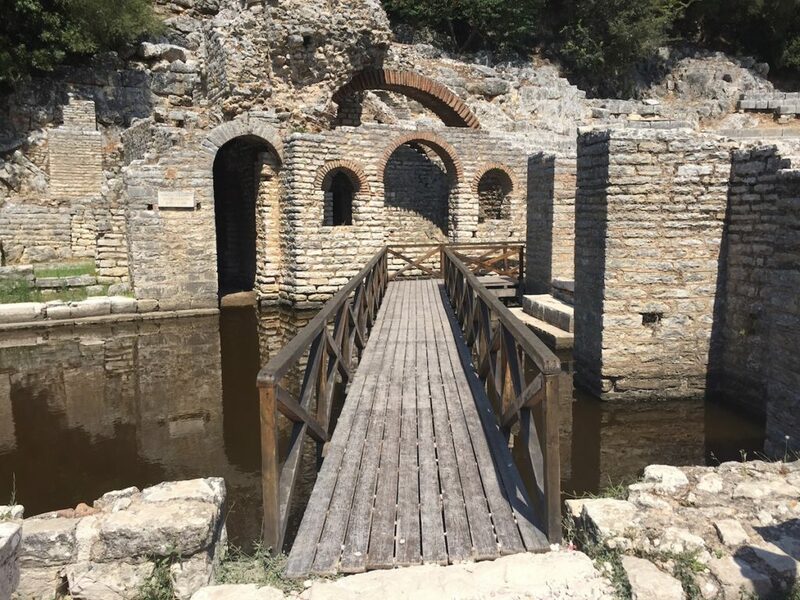 One of them, Butrint, is a 2,000 old set of Roman ruins. It has alternately been ruled by Romans, Byzantines, Venetians, and Ottomans. It’s set on a beautiful lake near the border with Greece, and it’s almost always completely deserted, making it a beautiful place to wander, snap photos, and imagine a simpler world taking place exactly where you stood over two millennia ago. 53. Gjirokastra is another UNESCO site, just as breathtaking as Butrint. It is an Ottoman era “museum city” complete with a gorgeous ruined castle perched atop a massive hill surrounded by houses with layered flat stone roofs. 54. In fact, Gjirokastra is also home to iso-polyphony folk music, which is a uniquely Albanian tradition honored by UNESCO’s intangible heritage designation. Every year, performances are held in the castle, keeping the tradition alive. To be honest, the music isn’t my cup of tea, but it’s incredible what they are able to do with their voices, creating unique, haunting sounds without the use of a single instrument. 55. Berat is twinned with Gjirokastra, though it’s worth visiting totally aside from Gjirokastra. It is the more famous twin, and equally gorgeous in my opinion, yet quite different. Berat is marked with only white paint and large square windows that look almost like eyes, giving it the nickname “City of a Thousand Windows.” Honestly, I think UNESCO made a mistake by twinning these cities together, which suggests that you can see one of the two and “get the idea.” They’re both incredibly unique places, and each warrants its own visit. 56. There are many other places on UNESCO’s tentative list that are also worth a visit. The Durrës Amphitheatre, Apollonia, and Ohrid, among others, are all on the list for consideration. 57. 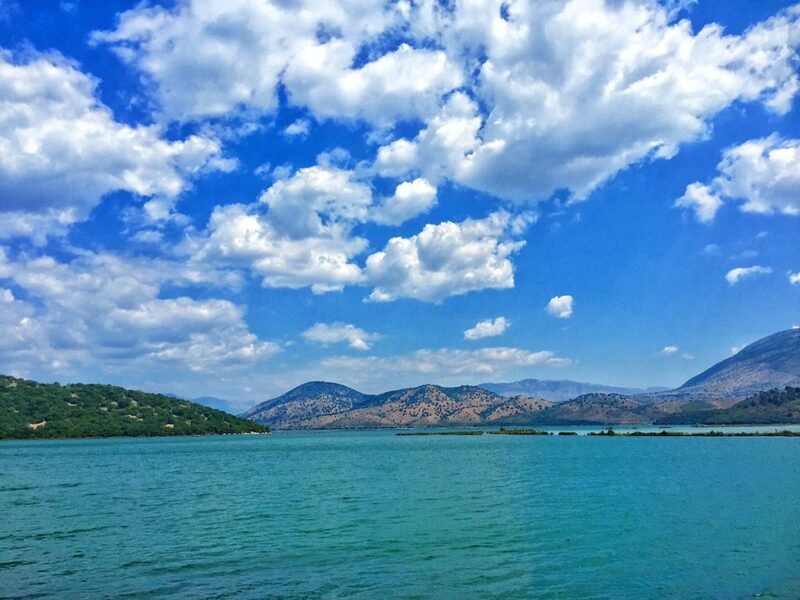 But historic cities aren’t all Albania has to offer – it has incredible lakes. 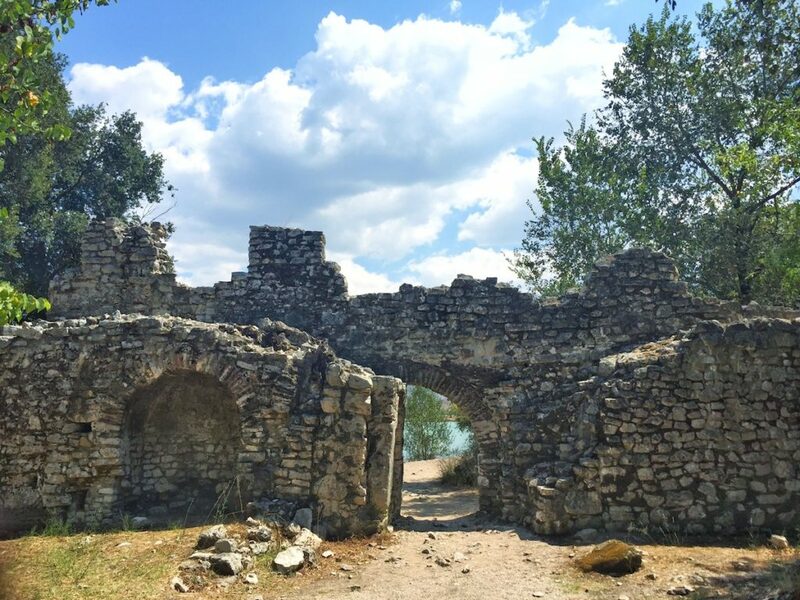 Lake Komani is the gem of Albania, followed closely by Lake Shkodra (which it shares with Montenegro), Lake Ohrid (which it shares with Macedonia), and Lake Butrint. All so different, yet so beautiful. 58. Besides its lakes, Albania has deep-flowing natural springs. 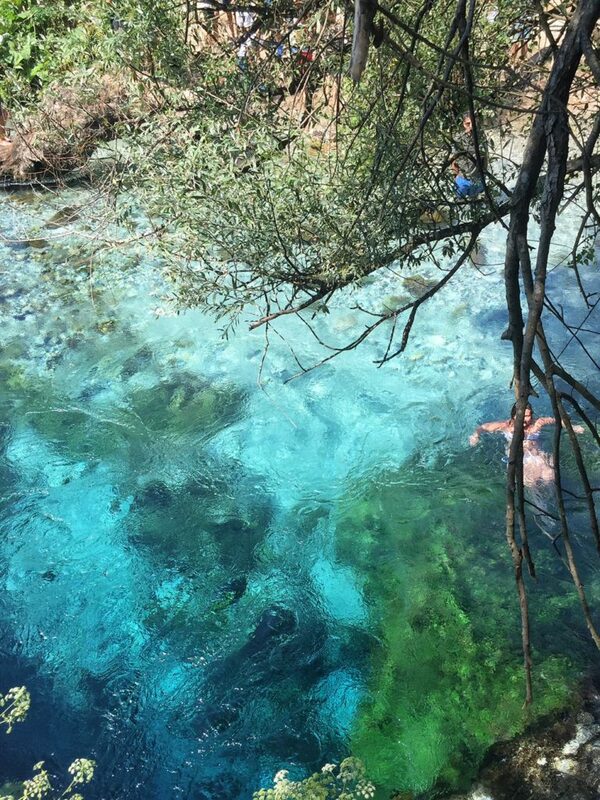 These springs are called “Blue Eyes,” and while there is an incredibly famous one in the south (called Syri I Kalter in Albanian), there is an equally beautiful though lesser known one in Thethi as well. 59. It has gorgeous waterfalls as well that locals love to swim in. The waterfalls in Begova near Berat are a favorite of locals when the summers get hot — with rakia, of course! It’s too bad I was in Berat in mid-October so I didn’t go to these waterfalls. 60. It even has a wine region with surprisingly delicious wine. I did, however, sample the surprisingly excellent local wines in Berat, courtesy of Cobo Wineries. 61. It’s yet to be Westernized with American fast food chains… well, except the one. 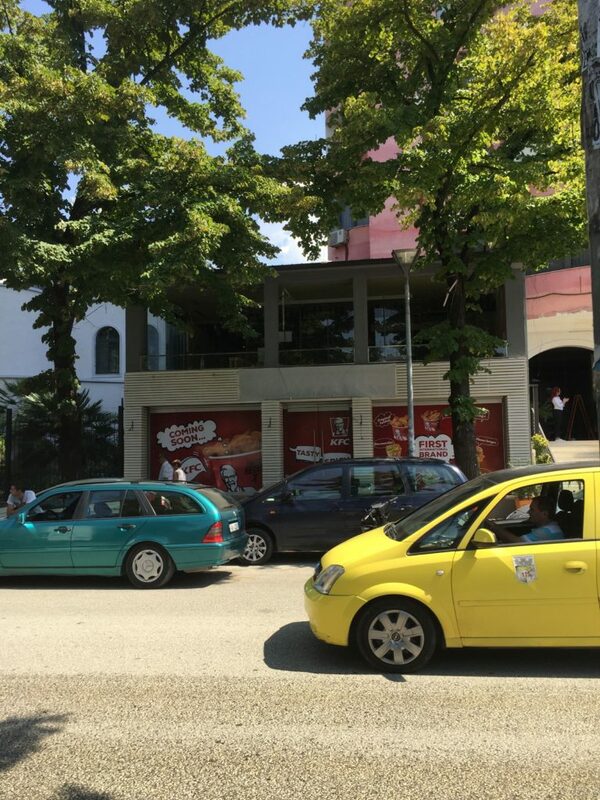 I love the fact that the country’s first international chain, KFC, is opening literally across the road from Enver Hoxha’s old mansion. I believe that’s what we call “throwing shade”, Albania. Nicely done. 62. 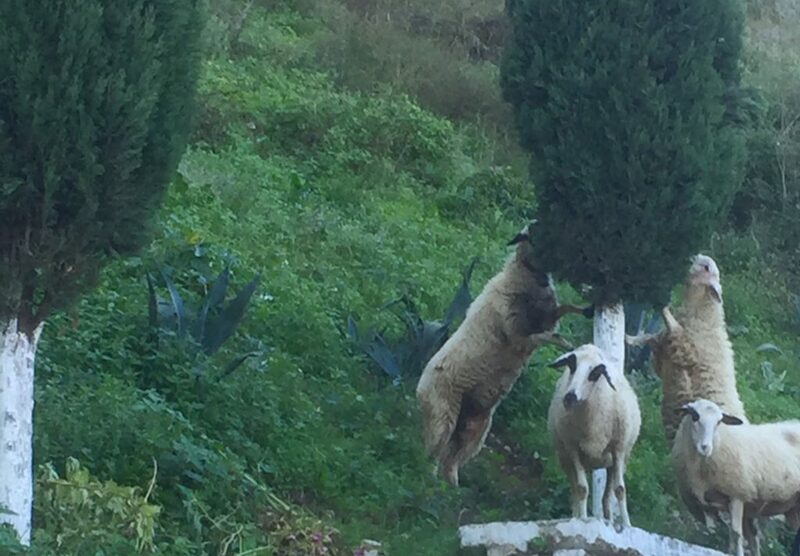 You’ll meet a lot of like-minded travelers in Albania. I guess because not many people travel to Albania, the tourists who do go there are really interesting, easy-going, and open-minded. I never met more interesting and fun people than I did when traveling in Albania! 63. Sometimes, it seems as if parts of Albania are stuck in a time capsule. You’ll be driving along a surprisngly smooth highway when suddenly, hey! There are goats and cows wandering the roads. 64. 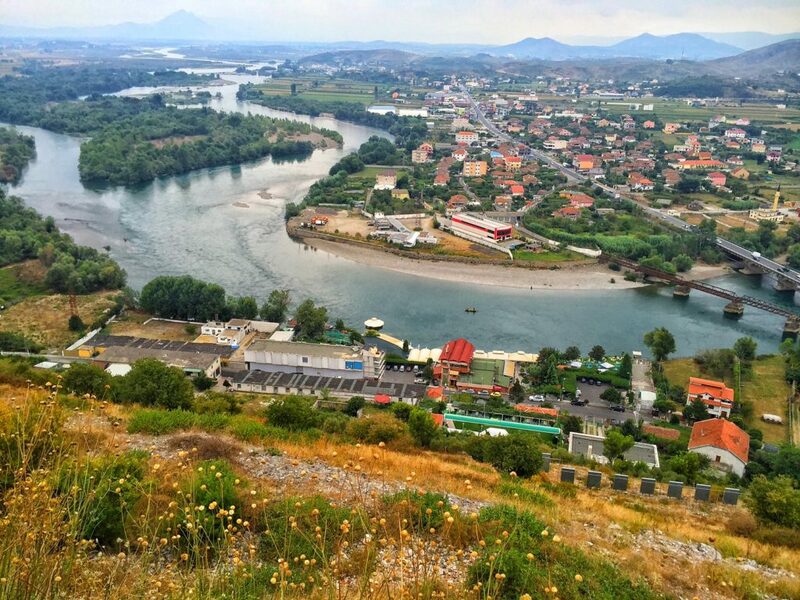 Albania is squarely outside the Schengen zone, making it perfect if you’re staying in Europe for over 90 days. Many countries in the Balkans, including Montenegro, Macedonia, Serbia, Kosovo, and Bosnia are also outside Schengen, so it’s easy to plan a little detour to Albania if you’ve used up the 90 days on your Schengen visa. 65. It’s quite easy for foreigners to get visas. 77 countries and territorities, plus every EU country, can visit Albania visa-free for 90 days. But even if you’re not one of those countries, if you’ve had and used a valid UK, US, or EU visa, you get the same 90 day visa policy as all other qualifying countries. 66. Though hostels are new the country, they are surprisingly excellent. Literally every single hostel I stayed at in Albania was excellent, and far better (and cheaper) than a lot of hostels I’ve stayed at in Western Europe, including cities like Rome and Barcelona. In fact, Trip’N Hostel in Tirana is probably the best hostel I’ve stayed at, period. 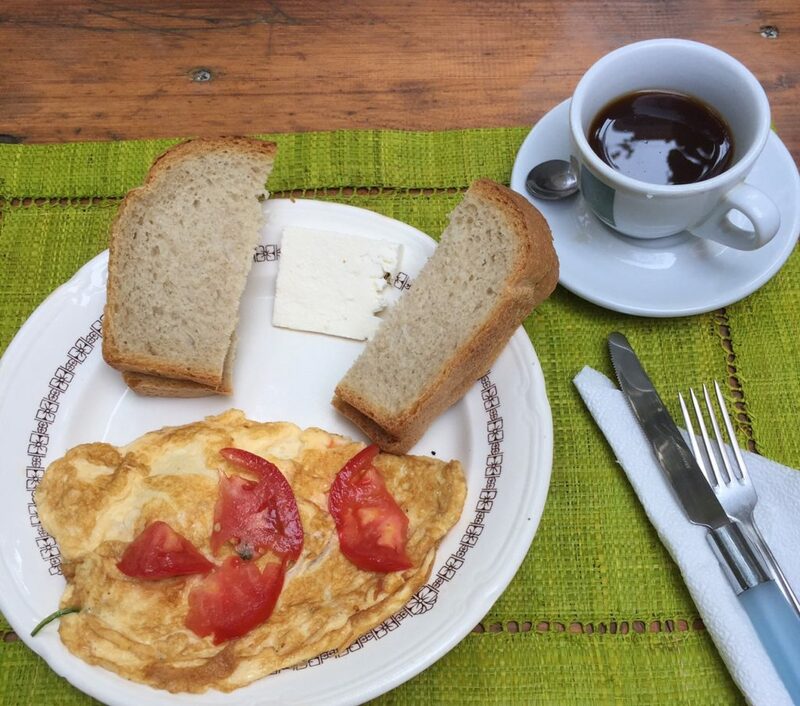 The best hostel I’ve ever stayed at for $12 a night, with this delicious omelette and Albanian coffee included. 67. 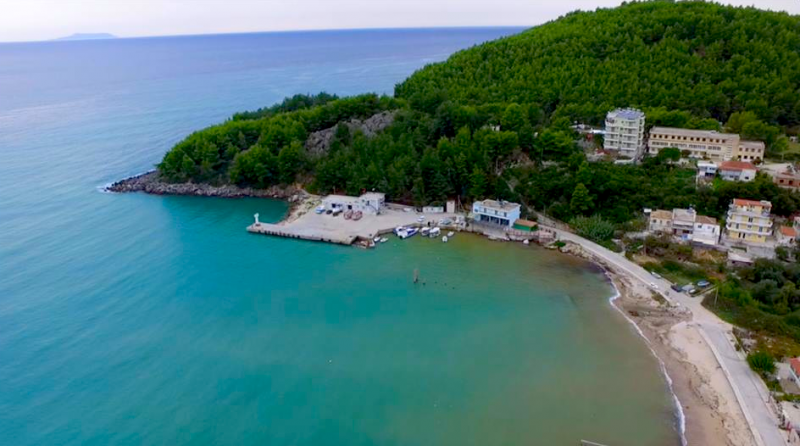 Albania is a delightful mix of discovered and undiscovered. 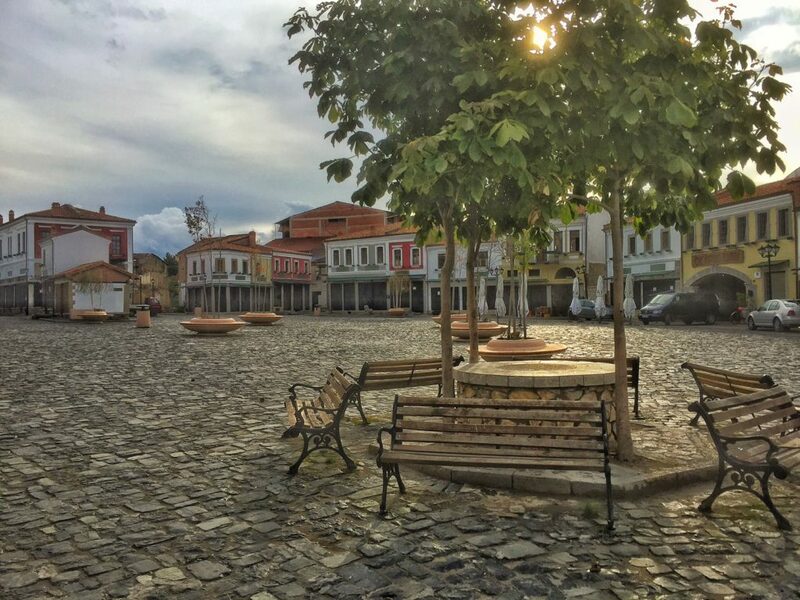 You can really choose your own adventure here… whether you want to stick to the slightly-well-trodden path of Tirana and Saranda, or if you want to get a little more off the path and visit the quaint smaller cities of Shkodra and Korca, there are tons of options, all within furgon distance. 68. Albanian wedding parties are the best parties. I stumbled across one happening in the street next to the gyro restaurant in downtown Himara. It was just a giant circle dance that got bigger and bigger, more and more intricate throughout the night. 69. Albania will teach you patience. I will admit that traveling in Albania is not the most straightforward, though I don’t think it necessarily makes it difficult. Sometimes, your bus will be late, or it will be unclear where you’re supposed to go. However, things always have a way of working out here. Give yourself some extra time and enjoy the ride. 70. Albania will also teach you trust. Because Albania isn’t the easiest place to get around, especially since the public transportation system is run mostly by word of mouth and there’s no online timetable, you’ll have to learn to trust strangers. But that is actually a blessing in disguise, because it’ll show you just how kind and caring most people in the world are. And even moreso in this special little corner of the world. 71. English is actually fairly widely spoken – followed closely by Italian. The second language of Albanians tends to fall on strictly generational lines. Those who grew up under communism likely stole television and radio signals from Italy as the only way of having contact with the outside world; therefore, the older generation by and large speaks Italian to some extent. Younger people, and anyone who works in hospitality, has a fairly good understanding of English. 72. But what Albanians may lack in language skills, they’ll make up for in doggedness, body language, and effort. 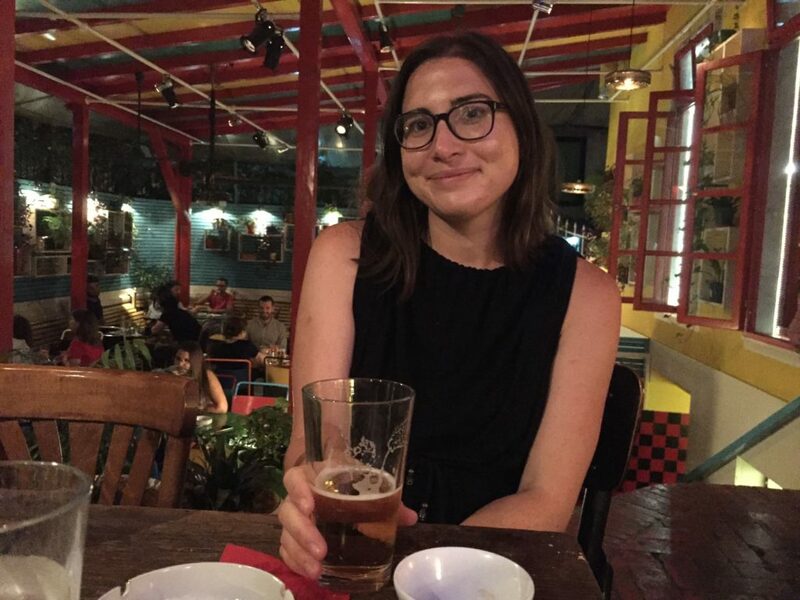 It’s not like an Albanian to shrug their shoulders and ignore you – they will do their damnedest to either answer your question through dramatic gesturing, dragging you down the street to finding someone who can help you, calling a friend on their phone and having you speak to them, or walking you right to your destination. 73. In short, Albanians are resilient and resourceful. They survived the most oppressive communist regime in history, saw the other end, and are now welcoming to outsiders from around the world. It’s astounding to me, a one-time New Yorker who hasn’t suffered anything more than the indignity of being trapped on a sweaty train car with five breakdancing teenage boys shouting “Showtime,” how people who have dealt with so much can be so welcoming, but they are. 74. Albania is changing… fast. 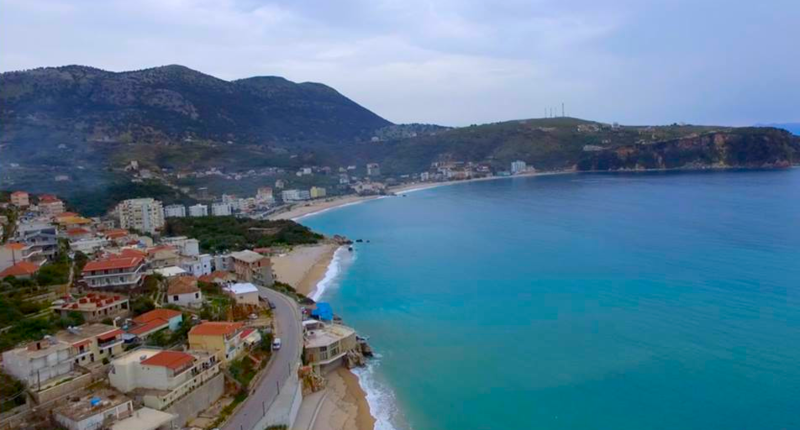 With foreign investments coming in and the slow march of tourism coming down from the Croatian coast through Montenegro, it won’t be long until Albania changes. 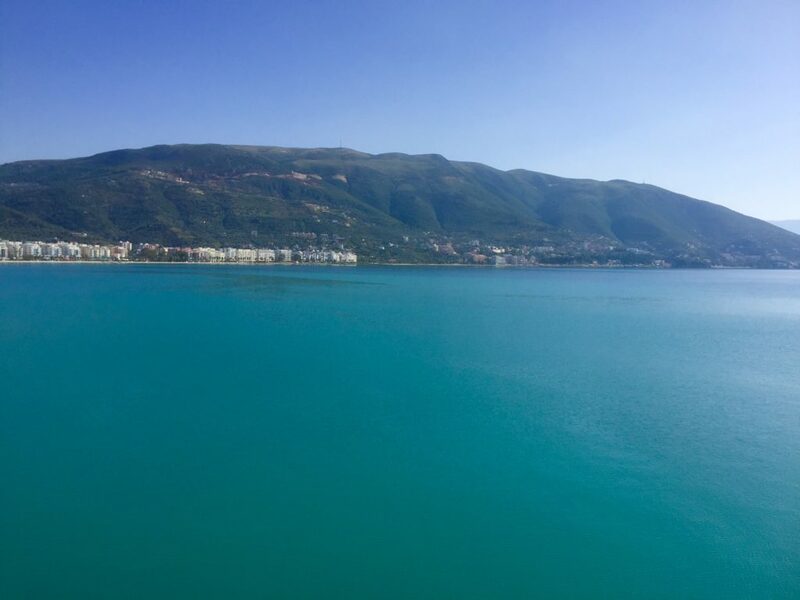 When cruise ships start regularly stopping at Albania… I must admit, I’ll be a little worried about what’ll happen to precious Himara and Dhermi.